On Wednesday, we were invited to dinner with some of our dear friends. We have been friends with them for almost 11 years. It is always fun to get together, and most of the time our children play together nicely. Regardless of who is hosting both parties contribute to the meal. My friend is an excellent cook, and because she did not grow up in the South as I did she has introduced us to different cuisines. One of the great things about meeting people from different areas is learning about the cultures that shaped them. I also believe that a great way to experience different cultures is to eat their cuisine. It seems like each culture and every person has a unique relationship with food. I love experiencing new and different cuisines. My friend prepared a wonderful vegetarian meal for us with an Indian flare. It was delicious. I was also happy because since we were eating vegetarian I didn’t have to feel guilty for the pie I had brought for dessert. I had talked briefly Wednesday morning with Jeffrey about what I should take for dessert. He answered quickly and emphatically with “PIE!” We easily agreed on this chocolate pie and it came together quickly in the afternoon with time to chill before dinner. 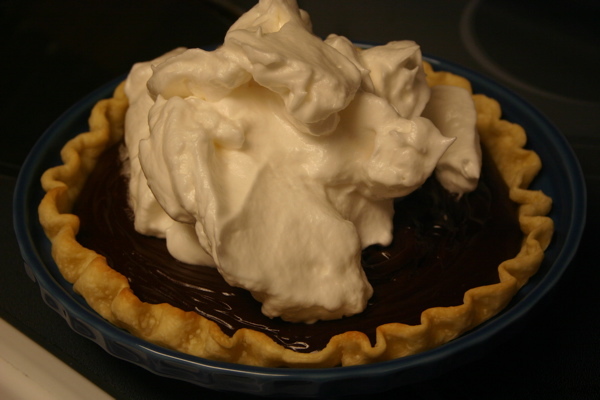 I’m not a huge meringue fan, though in the case of this desert, I really do enjoy the meringue on this chocolate pie. This recipe for meringue is quite delicious and foolproof. My boys like to call it the marshmallow topping. I have to agree that it is quite delicious and tasty and could very easily be described in a marshmallow-like manner. 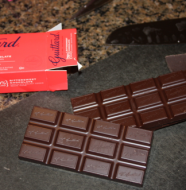 Melt butter and chocolate in a medium-sized saucepan. 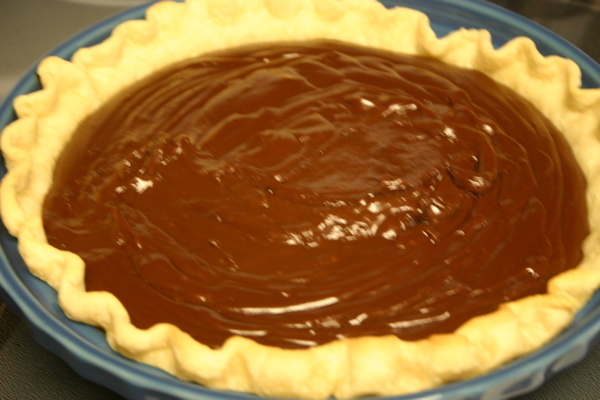 Mix the sugar, cornstarch, and cocoa powder together in a small bowl. Add the sugar mixture to the melted butter and chocolate and blend well. Pour the evaporated milk into a 2-cup measuring cup adding enough milk to measure 2 cups. (It should be about 1/2 cup.) Add milk mixture to chocolate mixture and stir until well combined. Take a small amount of the chocolate mixture and add it to your beaten egg yolks to temper (or bring them to the same temperature) as your chocolate mixture. Stir the tempered yolks into the chocolate mixture. Add the vanilla. Cook until thickened, stirring constantly. Pour into the cooked pie shell. 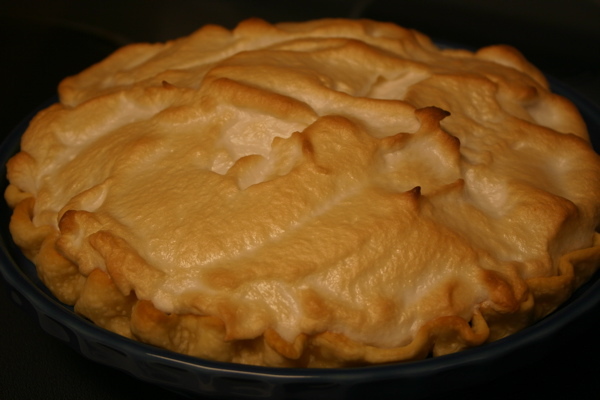 Top with Foolproof Meringue over the filling making sure it goes all the way to the edge to seal the pie. Bake at 450 degrees for 5 minutes or until golden brown. Chill, covered in the refrigerator. 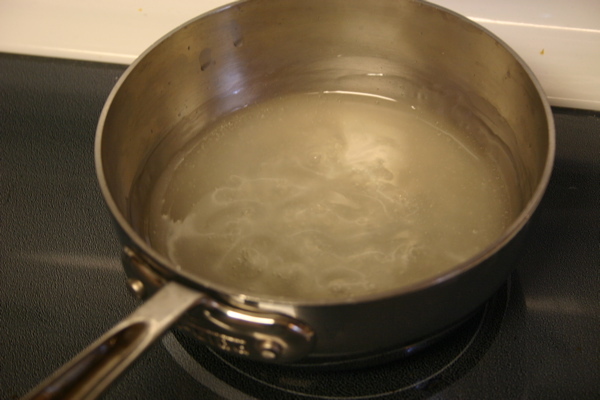 Combine the sugar, cornstarch, and water in a small saucepan. Cook for 5 minutes or until chear and thickened, stirring constantly. Cool slightly. Add the vanilla and stir until combined. Beat the egg whites and a pinch of salt with an electric mixer until soft peaks form. Gradually pour in the syrup mixture into the egg whites with the mixer going. Continue to beat until stiff peaks form. *Always put meringue on a warm filling. Light and fluffy meringue ready to be spread on top of the filling. Just out of the oven. Golden and Delicious! Adapted from Fresh from the Pantry. 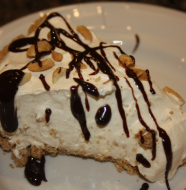 One Comment on "Decadent Chocolate Pie"
My family are chocohalics… I grew up eating chocolate for breakfast. 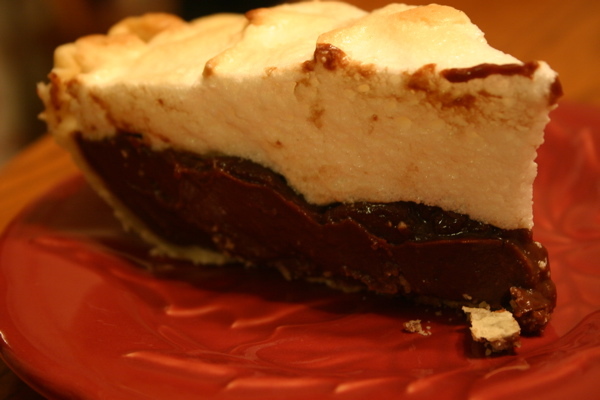 This is by far one of the most AMAZING chocolate cream pies I have ever eaten… and I had every single ingredient on hand. My folks fly in next week for our son’s baptism and Thanksgiving, and I will be making it for them too. Even my husband who doesn’t like pie, but loves pudding said the meringue was pretty awesome. 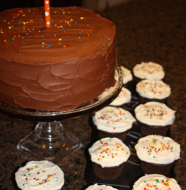 Thanks for sharing this recipe… if chocolate gives you those “warm fuzzies” then this is a keeper!!!!!!!! !